What's New For The 2019 Volvo XC60? Volvo's XC60 is a midsize SUV, one that's perfect for the Goldilocks among car buyers since it is a size that is just right. This midsize-luxury SUV is a two-row vehicle that seats five passengers. It has a comfortable amount of cargo space and an affordable price tag, making it a good choice for car buyers who prefer a combination of luxury and practicality. 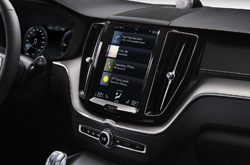 Volvo added heated seats and wiper blades to the 2019 XC60 AWD edition along with a rear 12-volt outlet to the vehicle model's base trim and power child locks. Blind-spot monitoring, keyless entry, a parking assistance system and power-folding rear outer head restraints are also new features that are available with the 2019 XC60. The 2019 Volvo XC60 comes in three trim levels: Momentum, R-Design and Inscription. 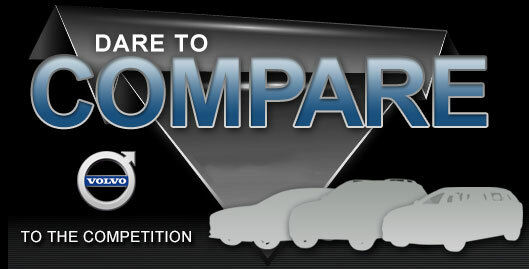 Car buyers can purchase each one with any of the carmaker's powertrains. Volvo calls them T5, T6 and T8 eAWD Plug-in Hybrid. The only available transmission with any XC60 is the carmaker's eight-speed automatic. The T5 Momentum is the model's base trim, and it comes with front-wheel drive and 18-inch alloy wheels. This model doesn't feel like a base edition since it also comes with a panoramic moonroof, LED headlights and a power tailgate along with a 9-inch vertical screen infotainment system. The T5 features a 10-speaker audio system in addition to dual-zone climate control. With the R-Design, Volvo decided to offer SUV buyers something sportier. This means that the vehicle comes with 19-inch wheels, LED front fog lights and door handles that are illuminated. The interior of the R-Design features front seats that come with seat-bottom extensions as well as shift paddles. These are located on the steering wheel, giving drivers customized control when driving the SUV. This trim level comes with leather seats, a premium audio system and quad-zone climate control along with driftwood inlays. Those who decide to purchase the Inscription trim can choose additional chrome and wood inlays. The dash is wrapped in leather and wood. This trim also features a cooled glove box and the upgraded amenities that are also a part of the R-Design trim model. 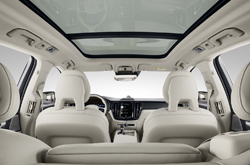 The car maker is offering the XC60 in a Premium package, which includes advancements like auto-dimming and heated wiper blades. Volvo is equipping its T5 Momentum SUV with a turbocharged 2.0-liter four-cylinder engine, one that pushes out 250 horsepower and 258 pound-feet of torque. Those who go with a T6 XC60 will also get the turbocharged engine, which generates 316 horsepower and 295 pound-feet of torque. Vehicle buyers who bring home the hybrid SUV can get a 2.0-liter turbocharged/supercharged inline-4 engine that produces 400 horsepower and 472 pound-feet of torque. Gas mileage ranges from 19 miles per gallon to 22 miles per gallon in the city and 27 miles per gallon to 29 miles per gallon on the highway depending on the engine. Those who buy the hybrid will get up to 58 miles per gallon equivalent. Volvos are famous for being one of the safest vehicles and people often buy them for this reason. 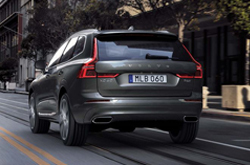 To ensure that the XC60 protects its occupants, the car maker is including road departure mitigation, collision avoidance and lane keeping assistance with every trim level. This is a vehicle that has Park Pilot Assist available. The system helps drivers parallel park and park perpendicularly. 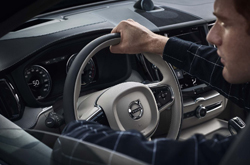 With the XC60, Volvo upped its game by offering an SUV that not only comes with the safety features that people have come to expect, but it also exhibits the kind of styling and power that make it desirable to own and drive.